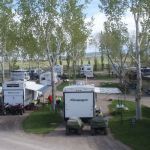 Ask fellow campers about "Fillmore KOA" and nearby attractions. This was a very clean and nice park. The staff was very friendly and competent. We camped at Fillmore KOA in a Motorhome. Great little KOA a good 1/2 mile from the freeway, so little traffic noise. It is managed by a very conscientious young couple. They keep everything very clean and well maintained. The women checked us in and took us to our site. Her husband was moving sprinklers at the time. The site was very level gravel and utilities easy to access. 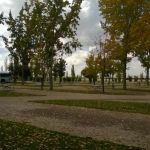 The sites are separated by a patch of grass with a number of poplars providing some shade. Will stay again on our way to Southern Utah. We camped at Fillmore KOA in a Fifth Wheel. The cleanest park I have ever been to, it was spotless. The young couple who manage the place were great they could not help you enough. They took us to our site made sure everything was working, this should be the standard by which all parks should be modeled after. Will be back. We camped at Fillmore KOA in a Motorhome. Beautiful location 1/2 mile away from the freeway, so no road noise. Lots of lovely trees-maybe Poplars. Nice, lush lawn at our site. Friendly check in. Level gravel site. WiFi useless. Cable good. We camped at Fillmore KOA in a Fifth Wheel. Big, spacious filling station nearby with diesel. Easy in/out with 5th wheel. Very nice, clean, super friendly park. The sites have plenty of room, and a grassy spot! Nice pool area to hang out and cool off. Great find! Make a reservation they fill up. We camped at Fillmore KOA in a Travel Trailer. This KOA is the best Journey KOA we have stayed at. The site were level with large trees for shade. They have nice grass areas between sites and easy access to the freeway. We will definitely stay here again. I would recommend this KOA. We camped at Fillmore KOA in a Travel Trailer. On the plus side this park is quiet and without highway noise. Unfortunately there are many negatives including general disrepair, bulging garbage bins and lack of maintenace throughout. Parking spaces are long but narrow. Two rigs share a space back to back. Getting into a space is difficult, getting out is terrible...especially if anybody is parked in the row in front of you. Big rigs will need an extender hose to connect to sewer. Park handouts proclaim numerous awards and while at one time the park may have been wonderful, it is now in dire need of maintenance and upgrades. Charging $40/night was salt in the wound. We shall not return and will look elsewhere when passing through the area again. Not as advertised. We camped at Fillmore KOA in a Motorhome. We only stayed overnight here, but the park is well maintained. Our site was full hook up and just long enough for us to stay hooked to our tow vehicle overnight. 35 ft 5th wheel. The only negative was the site was just slightly uphill and it make it a challenge to get level enough and stay hooked up. It would not have been an issue otherwise. We camped at Fillmore KOA in a Fifth Wheel. 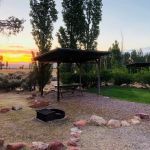 This is a great KOA, we have used this as a stop coming down I15 for years, and every year it just keeps getting better. It is what KOA should be striving for; clean, lots of gravel, green grass, hookups in the right spot, and service. We will continue to use this as a "journey" stop, and we are not KOA fans. We will continue to enjoy this CG when coming down I15. We camped at Fillmore KOA in a Motorhome. We stayed over a weekend and would have to agree with the previous reviewer who noted the plethora of ATVs. The campground was also mostly full during our stay. 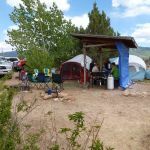 However, our fellow campers seemed polite and considerate, and noise from their groups was not excessive and pretty much stopped by quiet hours. 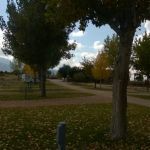 We loved the country setting and mountain views, and the campground itself was clean and well-kept. Sites have grass and many have some shade. Some sites have firepits; all have picnic tables. Managers were pleasant and friendly; they have a young child, so often need to be called if you need something in the office (they leave a 2-way radio out for that purpose). We would stay again, but probably not on a weekend. We camped at Fillmore KOA in a Travel Trailer. Town is small. If you want to eat out, Costa Vida, a Chinese buffet (frequented by busloads of Asian tourists) and a regional burger-shake joint are nearby at gas stations. We have stayed here before, and liked it. This time it was harder to rate. It was clean. Grass was green because they set up a portable sprinkler that also watered the side of my rig. They had a fun evening activity for the kids. They had a youthful worker that loved to zoom through the park in a golf cart. The big downside to us was that this is now an ATV base camp. We were one of the very few who weren't there to ride trails. ATV's putted (nicely) into camp late at night, and left before dawn. 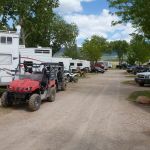 ATVs clustered in groups around their mothership motorhomes. Leaving the park was a slalom course of zigzags around vehicles parked everywhere. I would stay here again, but perhaps not during riding season. We camped at Fillmore KOA in a Motorhome. When coming from the North, my GPS wanted me to exit the first Fillmore exit. This routes you through town, and a lot of road construction. The campground is more easily accessed by the South Fillmore exit. The owners have gone to a lot of work to make this KOA one of the best I've stayed at. Lawns are green and well kept. Utilities worked well and are well placed. Check in was fast and friendly with a guide to help us locate our site. We were there for the ATV Jamboree and totally enjoyed our stay. Very little road noise made for nice peaceful evenings. We will be back! We camped at Fillmore KOA in a Motorhome. There are many fine parks we have stayed at over the years and this is certainly one of them. We have been here before and will be again. The staff has been great. The park is well kept with grass and trees. The K9 facility is grass, which my little girl poodle wants most. We were fortunate enough to be here during a spring snow storm. What a treat! The park is far enough away from the freeway noise and no train noise. It's close enough for eating places and fueling facilities. Propane on site. We camped at Fillmore KOA in a Motorhome. Easy access to the park. No roadway noise. Front office staff are very nice and helpful. Park is owned and operated by a lovely family. Lanes wide enough to maneuver easily. Sites are level, gravel and not too close to each other, with luxuriant grass between and big trees on either site and picnic table. 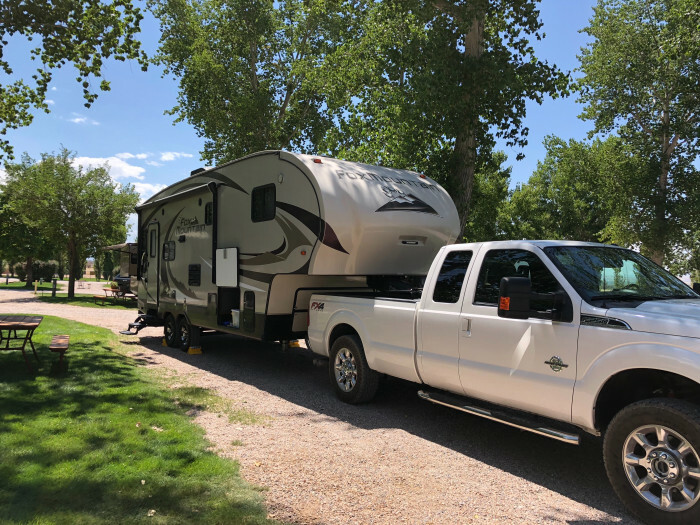 Long enough to park F350 in front of RV. Utilities-full hookup and work well. Excellent WiFI. Good AT&T Cell service. 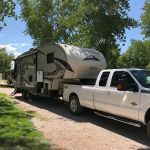 We camped at Fillmore KOA in a Fifth Wheel. Texaco on SW side of I15 fuel is less expensive. Take a walk thru town. Interesting. Eat at Costa Vida at the gas station on Hiway 99 as you leave Hi 15. Very good grilled chicken salad. This is our favorite place to stop. The owner runs a tight ship. Everything is clean, tidy, well kept, with very green grass between sites. The sites are very level with plenty of gravel, no dirt. The Park is a mile plus off the road, so nice and peaceful. The access road is a paved, two lane, and in great condition. There is open space around the park with national forest access from the park. There is a nice dog park but walking a little ways you can let Fido off the leash to run. The Wifi is fast as it was upgraded last year. We use the Parks wifi instead of our 4G. This place gets five stars! We camped at Fillmore KOA in a Motorhome. National forest close by with access from the park. Mushroom farm 2 miles away. Great Jeep trails close by. The local dealer will deliver 4X4 Razors to the park to rent if you call ahead. The Texaco on the south west side of I-15 has easy access and is cheaper than the station on the north end of town. We enjoyed taking the business route through town. Interesting town. Fillmore is a nice, clean town to explore. Are you affiliated with Fillmore KOA ?